Immunogen: Synthetic peptide corresponding to a portion of mouse TAK1. Scientific Background: TAK1 (TGF-beta-activated kinase-1) is a 65 kDa serine/threonine kinase that is a member of the MAPKKK family. TAK1 is involved in the regulation of transcription by the TGF-beta super family, as its kinase activity is stimulated by TGF-beta and bone morphogenetic protein (BMP). IHC Analysis: Human placenta tissue stained with TAK1, pAb at 10µg/ml. 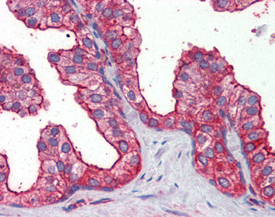 IHC Analysis: Human prostate tissue stained with TAK1, pAb at 10µg/ml. 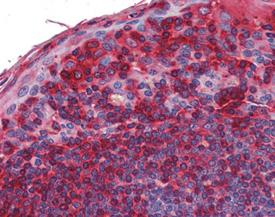 IHC Analysis: Human tonsil tissue stained with TAK1, pAb at 10µg/ml.